One of the most idyllic destinations in North India, Ladakh is a beautiful highland region between the Karakoram and the Himalayan mountain ranges. Food is a very important part of this region, as it is the case with the other parts of India. Ladakh has a strong Tibetan influence because of its proximity to the country and the several migrants that live here. You will also find a number of restaurants that serve Israeli, Chinese, Kashmiri wazwan, and North Indian food that is cooked with fresh herbs and produce from the highland which tastes amazing at such a high altitude. Since Ladakh is a barren land, most of the ingredients and produce used to prepare food is sourced from the plains. You will find a warm plate of momos and delicious bowl of thukpa everywhere, whether yo are near the monasteries in Ladakh, or anywhere else. The majority of the restaurants are located in the Main Bazaar of Leh and they offer both, vegetarian as well as non-vegetarian options. No Ladakh tour with a bike is complete without trying all the cuisines served in this region. You can start your day with a scrumptious breakfast of croissants, freshly-baked loaf of bread with hand-churned butter, yak cheese sandwich, and a hot cup of coffee at the Pumpernickel German Bakery on Zangsti Road. With the all the traveling and clicking photos, your stomach will start growling by noon. There’s no better place to go than the Norlakh restaurant situated in Main Bazaar, Leh. It is a hidden spot, it may take some time to find this restaurant but it is truly a gem. Norlakh is family-owned and has been run by generations. You will get to eat scrumptious dumplings and noodle soup out there. If you are looking for something simple yet delicious for lunch, then head over to Lamayuru Restaurant on the Fort Road of Leh. They have an exhaustive menu of several types of parathas, authentic Israeli cuisine, Tibetan food, vegetable and meat biryani, and Lafa, which is a must-try. Later in the evening, you can ask your Ladakh tour guide to take you to Lala’s Art Café to try their freshly brewed coffee and different varieties of Tsampa. They also serve amazing Khambir with butter, Butter chai, and hot chocolate that will keep you wanting for more. It is a part of the demolished Sankar Monastery Labrang. 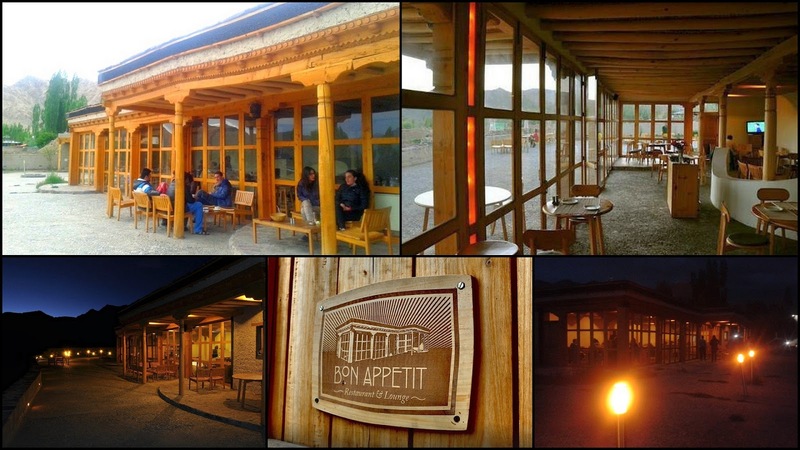 Stop at Bon Appetit for a quiet dinner with a beautiful view of the Himalayas. Don’t forget to try fried aubergine-stacks, barbeque chicken, and tandoori at the restaurant. La Pizzeria is another wonderful option, which is famous for their pumpkin soup, pizzas, and beer. If your taste buds crave something hearty, visit the Chandan Dhaba for mouth-watering desi thali of roti, sabji, daal, and rice along with sweet lassi. With a Ladakh tour package, you can visit all the restaurants that truly embody the Ladakhi culture. Summer Harvest is a cosy restaurant in Leh known for their fried mutton momos, Chinese noodles, rogan josh, and chilled beer. Another place you should definitely visit as a part of Ladakh tourism is Tibetan Kitchen. The restaurant is famous for its traditional hot pot called Gyako that is often shared among four people. When you are there, also try the Shabalay, which is a bread stuffed with vegetables or meat. Ladakh has a vibrant food culture, so make sure you enjoy every bit of it.